I love the winter landscape! It is such a joy to explore on skis or snowshoes, looking for the tracks of critters through the forest and enjoying the pristine white of the snow blanket and the evergreens laden with snow. Giclee print in a single mat ready for a standard 8 x 10 frame. The original is sold. 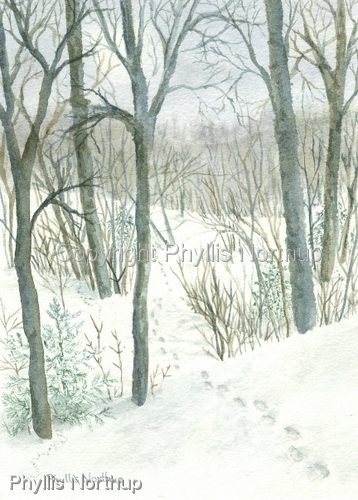 This is one of a series of paintings depicting the seasons.